Filibuster Star Davis Described as "Total Fighter"
To lead their nearly 13-hour filibuster attempt aimed at blocking a contentious abortion bill, Texas Democrats turned to a 50-year-old lawmaker who pulled herself up from a tough background as a teenage mother to graduate from Harvard law school. Once dismissed by Gov. 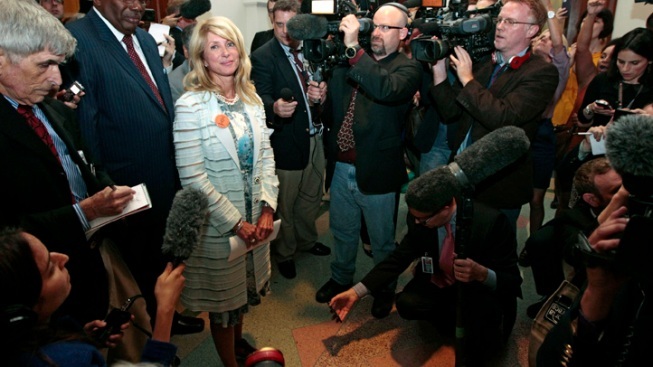 Rick Perry as a "show horse," Sen. Wendy Davis has earned a reputation for being willing to spar with the state dominant political party and its leaders. "She's a total fighter," said Cecile Richards, president of Planned Parenthood Action Fund and daughter of the late former Texas Gov. Ann Richards. "And the thing about Senator Davis, she says she's going to do something, she gets it done." Davis' filibuster lasted about 11 hours Tuesday before Republicans complained she had strayed off topic and cut her off. But the action prompted a lengthy debate with Democrats and raucous protests from the gallery that spilled into Wednesday morning and ultimately killed the abortion bill. 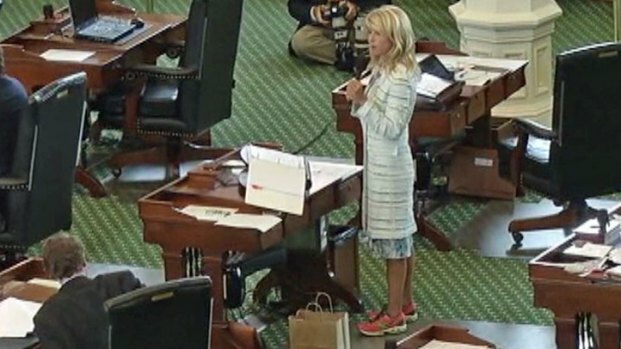 Wearing pink tennis shoes to prepare for nearly 13 consecutive hours of standing, Democratic Sen. Wendy Davis began a one-woman filibuster to block a GOP-led effort that would impose stringent new abortion restrictions across Texas. The developments also made Davis a hot topic online: Her Twitter followers swelled from 1,200 Tuesday morning to more than 20,000 by the evening. Additionally, both her name and the hashtag #standwithwendy trended nationwide during the closing portions of her filibuster. Davis also gained some Twitter support from some notable politicans, including President Obama. 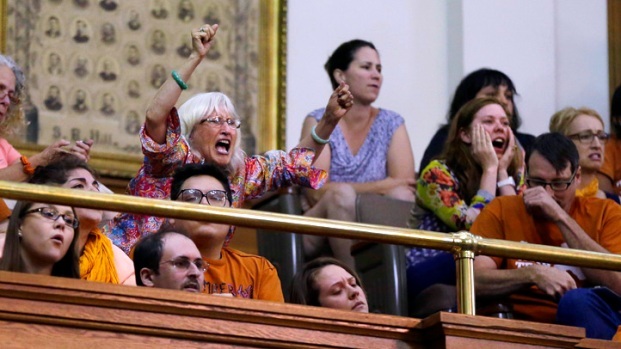 Hundreds of jeering protesters helped stop Texas lawmakers from passing one of the toughest abortion measures in the country, shouting down Senate Republicans and forcing them to miss a midnight deadline to pass the bill. "My back hurts. I don't have a lot of words left," Davis said after being showered with cheers by activists at the Capitol. Davis, 50, starting working at age 14 to help support a household of her single mother with three siblings. By 19, she was already married and divorced with a child of her own. After community college, she graduated from Texas Christian University before being accepted to Harvard Law School. According to her website, Davis graduated Harvard Law with honors. She returned to Texas, where she became a Fort Worth city council member before staging a political upset to beat an incumbent Republican to win a seat in the state Senate. "We knew about her on the City Council," said Sen. Rodney Ellis, D-Houston. "And we knew her track record as someone you could count on in the heat of battle ... She's been a leader on women's health and women's issues." Davis has clashed with Texas Republicans almost since arriving in the Capitol, earning derision and respect for her ability to dissect a complex bill and make her opponents squirm under tough questioning. In 2011, Davis led a short filibuster on the final night of the regular session that torpedoed a key budget bill to allow the state to cut more than $4 billion from public education. Despite warnings that the filibuster would be futile because Perry would immediately call lawmakers back into special session to pass the bill again, Davis and Democrats carried on, taking the short-term victory. Hundreds of orange-clad abortion rights activists who jammed into the Senate gallery Tuesday cheered her arrival with thunderous applause and shouts of "Go Wendy!" and "Thank you Wendy!" "I'm rising on the floor today to humbly give voice to thousands of Texans who are being ignored," she said when her speech began, later adding: "These voices have been silenced by a governor who made blind partisanship and personal political ambition the priority of our state." An avid runner and cyclist, Davis was in good shape for the physical challenge of standing and talking for nearly half a day. Because the rules wouldn't allow her to sit down, her chair was removed when she began her marathon speech. Davis wore pink tennis shoes and shifted her weight from hip to hip as the hours ticked by. Later, someone helped her with a back brace -- prompting a complaint from a Republican lawmaker. To stay sharp, Davis slowly circled her desk, pausing occasionally to read from a large binder on her desk. When a solitary male protester stood in the Senate gallery and shouted, "Abortion is genocide!" Davis calmly kept talking to without interruption as the man was removed by security. At one point, Davis fought through tears to read testimony from women who opposed the bill and described their personal stories.